This Monday, June 25, 2018, the Joe Andruzzi Foundation, its supporters, and a host of local athletes and celebrities, came together at Pinehills Golf Club in Plymouth, Mass. 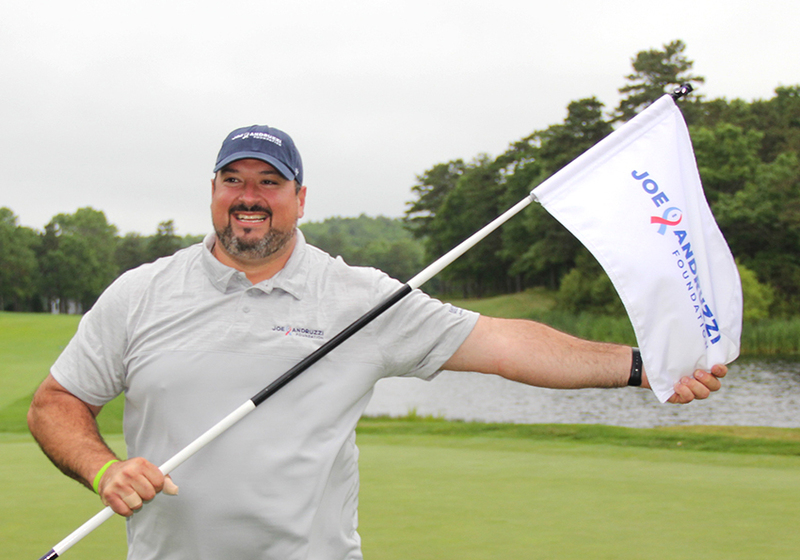 for the 10th Annual Joe Andruzzi & Friends Golf Tournament to have a day of fun out on the links and to raise crucial funds in support of New England cancer patients. By the end of the day, more than $350,000 had been raised in support of JAF patients and their families, allowing the Joe Andruzzi Foundation to provide financial assistance to hundreds of New England cancer patients in the months to come. That means, over the course of 10 years, our golf tournament has raised more than $2.2 million! So much of the success of the event is due to our incredibly generous supports, led by our Presenting Sponsor (and long-time JAF supporter) East Commerce Solutions, Inc.
ECS CEO Ed Medeiros and President Lisa Medeiros have long been champions of our Foundation, and Monday’s tournament marked their eighth year as a JAF Golf sponsor and fifth as Presenting Sponsor. The event could not have grown to where it is today without their unbridled support and unwavering commitment towards JAF’s mission, and we hope you will join us in sending a JAF-sized THANK YOU for their generosity. We also want to share our gratitude to so many other amazing sponsors who supported the event – including our Celebrity Sponsor Bob’s Discount Furniture, Dinner Sponsor J. Calnan & Associates, and Auction Sponsor J. Derenzo Companies – just a few of the numerous supporters who donated their time and resources to ensure we raised significant funds towards JAF’s mission, and we are forever grateful for their commitment towards the patients we serve. The round of golf featured just about every type of weather one could expect in New England, switching from frigid, windy, rain squalls in the morning to beautiful, clear, calm skies in the afternoon. And those blue skies were a welcome sight for many reasons, not just for the golfers. 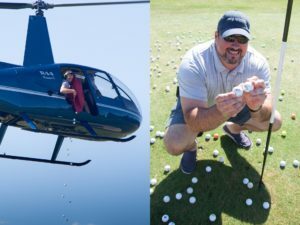 Somewhat new to this year’s event (though we dabbled years ago) was the addition of a helicopter ball drop fundraiser, where attendees had the opportunity to purchase individually numbered golf balls that were to be dropped on a practice green from a helicopter. The winner – the closest to the hole – would receive a half of the total prize money, with the other half benefiting JAF. Thanks to Blue Hill Helicopters, 12-year-old JAF patient recipient Tarun Kancharla was able to ride along for the fly-over, and even helped out dropping the balls onto the practice green. One of the highlights of the day occurred when, by chance, Presenting Sponsor Ed Medeiros’ helicopter-ball was not only closest to the hole…but had actually gone in! Ed immediately donated his half of the winnings back to JAF, and later, in the live auction, purchased a Patriots Ball Boy experience which he then donated to Tarun. We were also privileged to have a number of other patient recipients play-in and/or volunteer at the tournament. 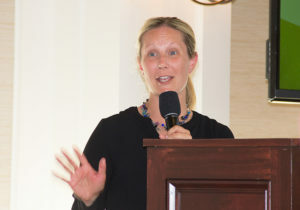 One former JAF grant recipient in particular – Dawn DeLuca – shared her motivational story with our golfers during the post-round dinner program. Diagnosed with stage III rectal cancer in 2015 at age 32, she endured two rounds of chemotherapy, radiation, and multiple surgeries before being declared cancer-free in July of 2016. Dawn, a registered nurse, told the crowd about her journey – how she had received a financial assistance grant from JAF during her battle and immediately sought the chance to give back in some way. That led her to run the 2017 Falmouth Road Race for the Joe Andruzzi Foundation, where she raised funds in support of JAF patient recipients just like herself. Unfortunately, as Dawn shared with the golfers in the room, her cancer has since returned, and she is currently undergoing treatment again. Dawn’s words had a clear message that resonated with our golf attendees: to keep “paying-it-forward” and to wake up each morning with a sense of appreciation and gratitude. How is she living that mantra? “This August, I will be running the Falmouth Road Race again for the Joe Andruzzi Foundation,” she announced to the crowd. If that isn’t the exact definition of “UpBeat Cancer”, we don’t know what is. And, of course, we want to thank the all-star list of celebrities/athletes/coaches who donated their time to support the event, including current and former Patriots greats David Andrews, Patrick Chung, Troy Brown, Patrick Pass and Matt Chatham; the radio voice of the Patriots, Bob Socci; former Red Sox great Jim Rice; country music star Louis Bello; and many, many others. We also want to send a special shout out and thank you to the always-hilarious Lenny Clarke, who once again reprised his roles of auctioneer after the round. And last, but certainly not least, we want to thank all the participants, board and committee members, and volunteers who generously donated to the event and auction, both with their time and resources. Our annual golf event enables us to keep on giving to those whose lives are affected by cancer, and we are forever grateful to everyone who joins us in this mission. It truly is a touching reminder of what can be accomplished when we all come together to pay it forward. 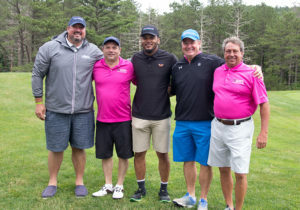 Be sure to check out our Facebook photo album for some amazing on-the-course shots, and mark your calendars down to save the date for next year’s 11th Annual Joe Andruzzi & Friends Golf Tournament on Monday, June 24, 2019, right back at our favorite course, Pinehills Golf Club!